A century and a half had elapsed since the invasion of De Soto, when the French began to explore the fertile regions watered by the Mississippi. Joliet, Marquette, and La Salle led the way in this adventurous exploit, the latter taking possession of its mouth for France. He named the country Louisiana, in compliment to the French monarch, Louis XIV. The Spaniards had already planted themselves at St. Augustine and Pensacola, when Iberville, a French naval officer, one of seven distinguished brothers, landed the first French colony at Biloxi. A fort was erected, Sanvolle, his elder brother, was appointed Governor, and Bienville, a younger brother, Lieutenant-governor, of Louisiana. The site of New Orleans was selected for the principal settlement. After twenty years' service in the colony, Bienville became governor, in 1718. The Southern Indians inhabited the region now embraced in the States of Florida, Alabama, and Mississippi, most of Georgia, and portions of South Carolina, Tennessee, and Kentucky. These Indians, sometimes called Appalachians or Mobilians, were divided into three distinct confederacies: the Creeks or Muskokis, including also the Seminoles and the Yamassees; the Choctaws, whose country, bordering upon the Gulf of Mexico, was west of the Creeks and extended to the Mississippi; and the Cherokees, the mountaineers of the South, whose land extended from the Cherokee Broad River, on the east, to the Alabama, on the west, one of the most delightful regions in the United States. The Chickasaws, who were united with the Choctaws, were seated upon the western branches of the Mobile, in Mississippi, Kentucky, and Tennessee. On the banks of the Mississippi, chiefly on the bluffs where stands the beautiful city that bears their name, the Natchez Indians once dwelt. It was a region of great fertility, and lay between the territories of the Choctaws and Chickasaws. They had originally inhabited the south-western portion of Mexico, and had brought thence many of their religious rites and customs. Their form of government was more despotic than that of the other Southern tribes. The great chief of the Natchez bore the name of the Sun, and pretended to claim his origin from that luminary. Every morning as it rose above the horizon he stood at the door of his cabin, turned his face towards the east, and howled thrice, at the same time prostrating himself on the ground. A pipe, used only upon these occasions, was then handed him, from which he puffed smoke, first towards the east, then towards the other cardinal points. "The Sun has eaten," proclaimed an officer of his household, before the ruling chief of the Sun, after each morning's repast, "and the rest of the earth may now eat." The death of the Great Sun was sometimes followed by that of one hundred persons, who considered it a great honor to be sacrificed at the same time. The Temple of the Natchez was oblong in form. In it were kept the bones of deceased chiefs, and in the middle of the floor a fire was kept constantly burning. One of their traditions is, that the keeper of this sacred flame having on one occasion fallen asleep, the fire went out, and in consequence a horrible malady raged for years, during which many of the Suns and an infinite number of people died. When Iberville first visited them, in the spring of 1700, their population did not exceed one thousand two hundred. Bienville, in April, 1716, led a small party into the territory of the Natchez, to revenge the murder of some Frenchmen. He intended, after making an example of some of their chiefs and intimidating the tribe, to proceed to their towns, and build a fort in obedience to the orders of his king. He halted on an island in the river, at some distance from Natchez. 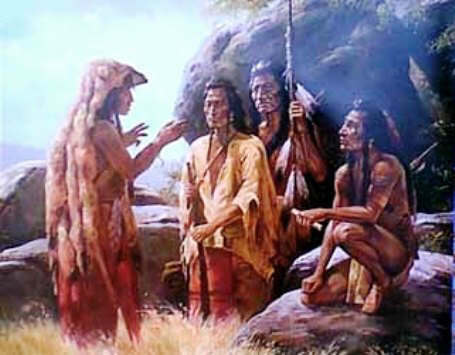 Here three of the tribe came to see him with the pipe of peace, but Bienville sent them back, telling them he would smoke with the Great Sun chiefs only, for he was the great chief of the French, and that their chiefs had shown a want of friendship and respect in not coming themselves to greet him. The Frenchmen thoroughly understood the Indian character. One morning not long afterwards, Bienville saw four magnificent canoes descending the river and approaching his island camp. Eight warriors stood erect and sung the pipe-song, while two chiefs in each canoe sat under an immense umbrella. They were the Natchez chiefs, drawn thither by the snare of the wily Frenchman. Concealing one-half of his soldiers, and advancing in a friendly way, he led them into his camp. They entered, singing the song of peace and holding the pipe over his head. Bienville refused the pipe offered him by the chiefs with contempt, and inquired the cause of their visit. Then the high-priest, after addressing the sun, and invoking its aid to soften the stern Bienville, also offered him the peace-pipe, which was again scornfully rejected. At the same moment the chiefs were seized, ironed, and put in prison. At night Bienville informed the Grand Sun that nothing would satisfy him but the heads of those who had advised or executed the murder of his countrymen. They were sent for, and the heads of two of them were brought him. Bienville then made a treaty with them, sparing their lives on certain conditions, and no longer refusing to smoke with them the pipe of peace. A fort was then built on an eminence advantageously situated near the Mississippi; when it was finished, six hundred Natchez warriors appeared unarmed before the gate, and joined three hundred women in a dance in honor of Bienville. Afterwards the chiefs crossed the threshold, and again smoked the peace-pipe with him. Some years later Fort Rosalie, as it was called, and the post of Natchez was under the command of M. de Chopart, a man wholly unfit for the position. This officer, for purposes of his own, selected the village of one of the Suns, or great chiefs, and ordered him to go elsewhere. Justly indignant at this outrage, preparations were quietly made by the tribe to cut off the French by a sudden attack here and at other settlements lower down the river. The neighboring tribes were also enlisted in the plot. Chopart was warned of the danger, but instead of taking precautions against it, had those who gave him the information put in irons. The massacre began about nine o'clock in the morning. The arrival of a number of richly-laden boats for the garrison and the colonists determined the Indians to strike their blow sooner than they had intended. Dividing themselves into parties, they gave out that they were going on a grand hunt, and began to traffic with the French, giving them poultry and corn, and in return obtaining arms and ammunition. Being now intermingled with the French, and provided with arms, they attacked at the same time each his man, and in less than two hours they had massacred more than two hundred of them, among them Chopart, the commander of the fort�the cause of this terrible slaughter. To show their contempt for this man, the Indians would not permit a warrior to kill him, but for that purpose sent a "mean "person, who pursued the wretch from his house into his garden, and there despatched him with a wooden tomahawk. Two men only were spared�a tailor and a carpenter, whose services the Indians required. Some of the women were killed, others were made slaves, and treated with great indignity. The post at Yazoo was soon afterwards surprised and its garrison massacred. When this terrible massacre became known the consternation was great throughout the colony. Governor Perier, at New Orleans, immediately sent the Chevalier De Loubois against the Natchez. At the same time seven hundred Choctaws, under M. Le Sueur, marched to their village, surprised them at break of day, and set free a large number of prisoners, besides taking sixty scalps and a number of the Natchez. The victory would have been more complete if they had been less intent on freeing the slaves, or if they had waited for the arrival of De Loubois with his troops. The great body of the Natchez escaped by flight. Shutting themselves up in two of their forts, the Natchez proposed to surrender more than two hundred prisoners if the French commander would remove his artillery and withdraw his forces, or else all the prisoners should be burned. De Loubois consented; but the Indians, suspecting treachery, withdrew in the night and gained the opposite shore of the Mississippi, with all their women and children. The prisoners, however, were found in the fort and released. A large part of the tribe, conducted by the Great Sun, then established themselves upon the Washita River, others sought an asylum among the Chickasaws, and some settled in Alabama. But the French had not done with them yet. In November, 1731, Governor Perier organized an expedition, which in January following he led to the mouth of Black River, the site of the last stronghold of the devoted tribe. Investing the fort, the French encountered a spirited resistance. Mortars were used by them in this siege, and a bomb, falling in the centre of the court, caused great havoc, and still greater consternation among the Indians. At length they agreed to surrender the Great Sun and one war-chief, which Perier refused. They then consented to surrender sixty-five men and two hundred women and children, upon condition that their lives should be spared. That night, in the midst of a tempest of wind and rain, the miserable, hunted-down remnant of this unfortunate tribe abandoned their fort and endeavored to escape up the river. Perier's Indian allies pursued, and brought in one hundred of them. Next day the governor demolished the fort, and returned to New Orleans with four hundred and twenty-seven prisoners. At their head was the Great Sun and several principal chiefs. They were all sent to St. Domingo and sold for slaves. Such of the Indians as escaped the terrors of that tempestuous night attacked the French post and settlements on Red River. They were repulsed by St. Denys, the commandant, with the loss of ninety-two warriors, including all their chiefs. A remnant escaped by flight, but, as a nation, the Natchez no longer existed. The Chickasaws were the fiercest, most insolent, haughty, and cruel of the Southern Indians. They were constantly at war, and though, in comparison with the nations around them, a mere handful, they had seldom been defeated. It was natural, therefore, that they should despise the cultivation of the soil, as they could live on the proceeds of the chase and the plunder of their neighbors. The Chickasaws were the most expert of the American Indians in following the trail, and were also exceedingly skilful in the chase. Although their country abounded in beaver, they did not disturb them, saying, "anybody can kill a beaver." Their ambition was to capture the swift-footed deer or elk. They were all excellent swimmers, an art early taught to their children. They were very overbearing towards their females, and extremely jealous of their wives. They were athletic, well formed, and graceful. Chickasaw tradition says they came from the west, and on starting eastward were provided with a large dog, as a guard, and a pole, as a guide. The dog would give them notice of the approach of an enemy, and the pole, which they planted in the ground every night, would lean next morning in the direction they were to go. In this way they kept on until they crossed the great Mississippi River. Arriving at the Alabama River, near what is now Huntsville, the pole was for some days undecided which way to lean, but finally made up its mind and pointed to the south-west. They then resumed their journey, fighting their way through enemies on all sides, until, at a place now known as Chickasaw Old Fields, the pole stood perfectly erect. All then came to the conclusion that this was the Promised Land, and here they accordingly remained until, in 1837, the tribe emigrated to the Indian Territory. A small portion of the Natchez Indians had united with the Chickasaws, who were friends of the English, and of course enemies of the French. In order to establish French supremacy in that region, and to keep the communication open between New Orleans in the south and Kaskaskia in the north, Bienville prepared to invade the Chickasaw territory and subdue them. By a free distribution of presents he gained over the Choctaws, who consented to assist him in his enterprise. He embarked at Mobile, in a fleet comprising more than sixty large pirogues and batteaux. Never before had so large and imposing a fleet disturbed the deep, smooth waters of Mobile. He disembarked his forces at what is now Cotton Gin Port, twenty-seven miles east of the Chickasaw towns. Taking with him provisions for twelve days, he began his march, and encamped near the enemy. On the afternoon of May 26th the Chevalier Noyau advanced to the attack at the head of three hundred French troops. With the help of some Englishmen the Chickasaws had fortified themselves with much skill, and the French were not a little astonished on beholding the English flag waving over their adversaries. Their houses had been fortified by large stakes driven into the ground around them, and were loop-holed for musketry. Within the palisades were breast-works, from which, through the loop-holes, the Indians fired. Their houses stood in such positions as to admit of cross-firing. The attacking column was protected by movable breastworks, called mantelets, carried by negroes, and which served as shields. No sooner had these come within gunshot than one of the negroes was killed and another wounded; the rest fled precipitately. The French then rapidly advanced under a severe fire, and carried three fortified cabins, setting fire to and destroying others. Many of them had by this time fallen; but the officers, placing themselves at the head of a few brave men, attempted to storm the principal fort, but were nearly all shot down before they could reach it. At a safe distance from this scene of slaughter Bienville's six hundred Choctaw allies, painted and plumed and dressed in the most fantastic and horrible manner, yelled and shouted, but, beyond occasionally firing in the air, rendered no assistance. After the conflict had lasted three hours, De Noyau and the brave remnant of his men were compelled to retreat. Bienville's plan of operations had included a junction with D'Artagnette, a brave and experienced officer, who was to have assembled the tribes of the Illinois and, together with one hundred and thirty Frenchmen, united his force with that of Bienville at the Chickasaw towns. The unavoidable delays experienced by the latter caused the failure of the plan and disaster to both. D'Artagnette was the first to arrive. He sought in vain for intelligence of Bienville. The impatience of his red allies, who, after eleven days of inaction, could no longer be controlled, led him to attack the Chickasaws without further delay. His force consisted of one hundred and thirty French and three hundred and sixty Indians. At the first onset five hundred of the enemy, who had been concealed, rose from their ambush and fell upon the invaders, with such impetuosity that nearly all D'Artagnette's Indians took to their heels, leaving the unfortunate Frenchmen surrounded by their foes. After maintaining for some time a heroic but unavailing struggle, in which a large number of brave men had fallen, D'Artagnette, Vincennes, and a few others surrendered; a small number escaped. The fruits of this important victory were all the provisions and baggage of the French, eleven horses, four hundred and fifty pounds of powder, and one thousand two hundred bullets. The powder and ball were used to shoot down the troops of Bienville, as we have already seen. The prisoners were at first kindly treated, but after the defeat of Bienville all were burned at the stake excepting one, who was sent to Bienville with the intelligence of the defeat and fate of D'Artagnette. The Chickasaws remained masters of the situation. Little was known of the Cherokees who inhabited northern Georgia and north-western Carolina, one of the most beautiful and healthful regions on this continent, until the period of English settlement. In their appearance, their habits, and their customs, they bore a great resemblance to the Creeks. Owing to their delightful climate, with its mountain air and delicious springs of pure water, they attained a greater age than the other tribes. These Indians were of middle stature and of an olive color, but were generally painted. Their skins were stained with indelible ink, representing a variety of subjects. The women were tall, and symmetrically formed; their feet and hands were small and exquisitely shaped, and they moved with grace and dignity. The ears of the males were slit, and stretched to an enormous size�an exceedingly painful operation. They were very fond of dancing, spending almost every night in this amusement, and were skilled in getting up and preparing pantomimes, being excellent mimics. In January, 1733, General James Oglethorpe led a colony to Georgia, pitching his tent where the city of Savannah now stands. Though he had a royal title to the land, he took care to pay the Indians for it, and they were always friendly to him. The purchase was made of Tomo Chichi, one of their principal chiefs, who afterwards accompanied Oglethorpe to England. The Cherokees gave Oglethorpe a buffalo-skin, with the head and feathers of an eagle painted on the inner side. They said: "The feathers of the eagle are soft, signifying love; the skin is warm, and is the emblem of protection, therefore love and protect our little families." He was ever their true friend and they reciprocated his kindness. When, in 1740, he attacked the Spaniards at St. Augustine, he was accompanied on his expedition by one thousand Cherokee warriors. Mutual injuries had, at the beginning of the year 1760, brought about a state of hostility between the settlers on the frontier of South Carolina and their Cherokee neighbors. Governor Littleton, in violation of good faith and sound policy, had seized thirty-two of their chiefs, who had visited him for the purpose of preventing a war, and imprisoned them in Fort Prince George. His intention was to hold them until twenty-four Indians implicated in the murder of white men should be delivered up to him. This it was impossible for them to do, as the Cherokee chiefs had no power to coerce their countrymen, and the governor was so informed by Atakullakulla, their venerable head chief, the staunch friend of the white man. One of the imprisoned chiefs was Otacite, a renowned warrior. Their rescue was soon attempted. Oconostata, one of their leading chiefs and warriors, approached Fort Prince George with a band of his countrymen, and requested Lieutenant Coytmore, the commander, to come out and have a talk with him. That officer assented, and while they were conversing the chief swung a bridle which he held three times around his head. This was the preconcerted signal, and a volley from the concealed Indians mortally wounded Coytmore, and severely wounded two others who were with him. The garrison seeing the fate of their officer, at once proceeded to put irons upon the Indians in their custody, but meeting with a furious resistance, the exasperated soldiers put them all to death. Those without attacked the fort, shouting to their countrymen within, ignorant of their fate, "Fight strong, and you shall be aided." But the fort was too strong for them, and they finally withdrew. The vengeance of the tribe fell heavily on the defenceless frontier, which became a scene of blood and rapine, and the war-belt was sent to the Catawbas and other tribes, asking their aid in exterminating the English. Meantime General Amherst, the English Commander-in-chief in America, had despatched one thousand two hundred men, under Colonel Montgomery, from New York to the scene of action. This officer arrived in Charleston late in April, and moved rapidly towards the Cherokee villages. Coming after a night-march upon the town of Little Keowa, he surrounded it, and ordered his troops to bayonet every man. This was done, and the women and children were captured. In Estatoe, a town of two hundred houses, he found but ten or twelve men, all of whom were killed. Determining to make the Indians feel the power of the English, he visited, and in succession destroyed, all the villages in the lower nation. Montgomery then returned to Fort Prince George, where he awaited proposals for peace. None came, and he again advanced, this time on the middle settlements. In three days he reached the town of Etchowee. Here the Cherokees had determined to make a stand. A smart fire was opened upon the advancing troops from a thicket. Montgomery immediately pushed forward through an ambuscade of five hundred Indians, rousing them from their coverts. As soon as they reached clearer and more elevated ground, the troops drove the enemy be- fore them at the point of the bayonet, and a severe chastisement was inflicted upon the Indians. Etchowee was found to be abandoned, but the warriors had generally escaped to the mountains, and the only result of the expedition was to increase the wrath of the tribe. Unable to effect anything further, Montgomery returned to New York. A band of Creek Indians, under Chlucco, better known as the Long Warrior, Micco, or King of the Seminoles, accompanied Montgomery in his expedition and rendered essential service. By their aid the army escaped ambush after ambush, discovered the Cherokee villages, and finally covered his retreat out of one of the most dangerous countries through which an army could pass. Fort Loudoun was garrisoned by two hundred men. Oconostata invested it with a large number of warriors, cutting it off from all communication. When the garrison was nearly famished, seeing no hope of escape the fort was surrendered, on condition that the men should retain their arms and march home unmolested. Their first night-encampment was fifteen miles from the fort. Next morning they were attacked, and nearly all slain or captured. This was done in retaliation for the massacre of the Cherokee hostages. In the following year Carolina raised twelve hundred men, under Colonel Henry Middleton. Among his officers were Henry Laurens, afterwards President of Congress, Francis Marion, William Moultrie, Andrew Pickens, and Isaac Huger, all of whom became distinguished as soldiers and patriots in the Revolutionary War. Lieutenant-colonel James Grant joined them with two British regiments, and some Chickasaw and Catawba Indians as allies, making a total force of two thousand six hundred men. They reached Fort Prince George May 29, 1761. On the 10th of June, at Etchowee, the scene of Montgomery's battle the year before, the Cherokees were gathered, well equipped and prepared for action. They had an advantageous position, and for three hours the contest was severe and bloody. They were finally driven at the point of the bayonet, falling back inch by inch until at length, completely overpowered, they fled, hotly pursued by the victors; many were slain. Following up his victory, Grant laid Etchowee and fourteen other towns, together with their corn-fields and granaries, in ashes, and the people, in a state of complete destitution, were driven to the barren mountains. The spirit of the nation was broken, and through the venerable Atakullakulla, the chiefs humbly sued for peace. A treaty kept the nation peaceful until the breaking out of the American Revolution. During that struggle the Cherokees fought against the colonists, and were severely punished and greatly reduced in numbers. Their first treaty with the United States dates from 1785. Its guaranties were disregarded by the Federal Government, and contrary to their wishes, and in spite of their resistance, they were forced from their country at the point of the bayonet in 1838. John Ross, their principal chief, strenuously opposed the removal of his people. He was a half-breed, and at an early age had acquired a good English education, becoming head chief in 1828. A portion of the Cherokees, under the lead of Major Ridge, Boudinot, and other influential chiefs, in December, 1835, concluded a treaty with the United States Government for the removal of the tribe to the Indian Territory, which was repudiated by Ross and the larger part of the nation. Under this treaty the Ridge party�one-third of the tribe�emigrated in 1837. Ross and the remainder of his people held out against removal as long as possible, but, notwithstanding a decision of the United States Supreme Court in their favor, were finally compelled to go. The removal of the tribe was disastrous to them in many ways, but they are at present in a prosperous condition in their new home in the Indian Territory. The Cherokees had a singular method of relieving the poor. Their head men issued orders for a war-dance, at which all the fighting men of the town assembled. Contrary to the usual custom, only one man danced at a time, who, with a tomahawk in his hand, hopped and capered for a moment, and then gave a whoop. The music then stopped while he related the manner of his taking his first scalp. He then cast a string of wampum, wire, paint, lead, or anything he could spare, upon a large bear skin spread for the purpose. Then the music again begun, and he continued in the same manner through all his warlike actions. Another succeeded him, and the ceremony lasted until all the warriors had related their exploits and thrown presents upon the skin. The stock thus raised, after paying the musicians, was divided among the poor. The same ceremony was used to recompense any extraordinary merit. The Choctaws and the Chickasaws had a common origin, and are to-day substantially one people. Their traditions, like those of the Natchez, point to a Mexican origin. The Creeks were their great enemies. In 1765 a war began between them which raged fiercely for six years. Skillful in deceiving their enemies, they attached the paws of various animals to their own feet and hands, and roamed the woods, imitating their movements. Sometimes a large bush was carried by the warrior in front, concealing himself and those behind him, while the one in the extreme rear obliterated all the tracks with grass. Excellent themselves in following the trail, they could also deceive an enemy by their astonishing skill in imitating every fowl and quadruped. They were inveterate gamblers. Besides ball play, they had an exciting game called Chunke, the players and lookers-on staking their ornaments, wearing apparel, pipes, and arms upon the result. Sometimes after losing all, the ruined gambler borrowed a gun and shot himself. Indians are very like white men, after all. The women have a game with sticks and balls, something like our game of battledoor. Some of their funeral customs were peculiar. The assembled relatives wept and howled, and asked strange questions of the deceased, such as, "Why did you leave us? Did your wife not serve you well? Were you not contented with your children? Did you not have corn enough? Were you afraid of your enemies?" To increase the solemnity and importance of the occasion mourners were hired to cry. Among other odd customs of the Southern Indians was this�being sun-worshippers, whenever the head chief sneezed, his subjects bowed their heads, opened and closed their arms, and saluted him with these words: "May the Sun guard you," "May the Sun be with you," "May the Sun shine upon you," or "May the Sun prosper and defend you." If their knowledge of geography had been equal to their enterprise, a serious catastrophe that befell one of the Carolina tribes would have been prevented. The Sewees, a tribe living on the bay of that name, under the mistaken idea that England was not far from their coast, fitted out a large fleet of canoes, laden with skins and furs, for the purpose of traffic. All their able-bodied men embarked, leaving only the women and children and the aged and infirm at home. A storm destroyed a part of their fleet, and the remainder falling into the hands of the English, the Indians were sold as slaves in the West India Islands. Small-pox and intemperance still further reduced this once populous tribe. This story of the Southern Indians is featured in the book entitled the Indian History for Young Folks by FrancIs F. Drake and was published by Harper Brothers in New York and London in 1919.